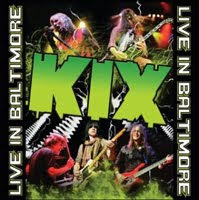 RockUnitedReviews: KIX: "Live In Baltimore"
"Atomic Bomb, Cool Kids, Midnight Dynamite, Blow My Fuse". KIX - arguably America's best party rock 'n roll band according to Kerrang of the past. Blimey, the magazine and their so called journalists of today would hardly even argue as this sort of discussion would never come up for debate in the first place. KIX always been the fun live act though performing more and more shows at festivals, casinos and biker rallys across the country since their mid-00's reunion, impressing promoters and fellow musicians with their top notch and highly entertaining performances. 'Do you feel happy? I feel happy too' - Steve Whiteman is a fookin' genius when it comes to working the crowd (ehem). 'Are you still happy? You sound happy, you look happy'. Can you imagine him during the grunge era or infront of an goth audience? He's way too happy and in a way that's what KIX are all about really. Tongue-in-cheek. You're not supposed to sink further down the s**t while catching KIX live in concert. They're not supposed to add more problem(s) to your world (that's reality for ya'). The excellent power ballad "Don't Close Your Eyes" contains anti-suicide lyrics for chirst's sake. That's Steve "Happy" Whiteman at his very best. Neither rocket science nor the cure for cancer... it's merely happy KIX rock 'n roll as well as the brief escape from your daily struggle. You'll go to sleep with Whiteman's words still ringing in your ears: are you happy, happy, happy, happy, etc.